With a population of 12,000, Siolim is one of the state's largest villages - not as though you would know it as you wander around the densely forested lanes, colonial era houses and colourful fruit and veg stalls that line the roads. Unlike Calangute just 10km south, the town has escaped the mass development that so defines the popular tourist areas of Goa's coast. Shops in the village are aimed at locals and not tourists, markets sell food rather than sequined lampshades and foreigners are usually in and out in as much time as it takes to withdraw R.5000 from an ATM. For anyone that sticks around, Siolim's appeal is quick to appear - the town is resolutely Goan, it has not changed itself for Western visitors. 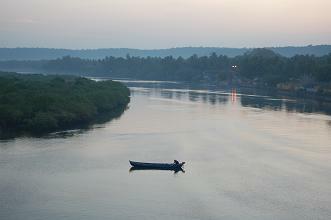 It produces some of the world's best feni, a uniquely Goan alcoholic drink brewed from cashews or coconuts, and there are some beautiful walks to be enjoyed by the river and along the shady lanes. The town's two main hubs lie a few kilometres apart. To the south a busy roundabout in front of the impressive St. Anthony's Church is surrounded by small market stalls and shops. To the north, Tar is a cluster of stalls around the old ferry crossing where a regular fish market takes place, and a bridge crosses the Chapora river. Between the two hubs, there is an intersection where buses from Mapusa pull in, and tourists pull over at the Exotic Regency building to use the cash machine. If you are travelling south to north, you will need to take a left at this crossroads to reach the bridge over the Chapora river. 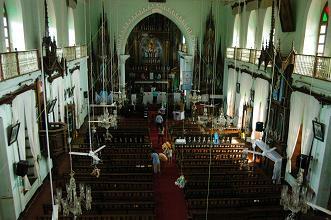 From outside St. Anthony's Church if you are coming north to south (crossing the small bridge and stream as you approach the church), turn left after the church to reach Mapusa, right towards Chapora or straight ahead to Anjuna, Baga and destinations down the coast. There are no budget guesthouses in town, visitors who want to explore the area could take advantage of the long-stay rental opportunities available in the traditional houses along the river on the way to Chapora. 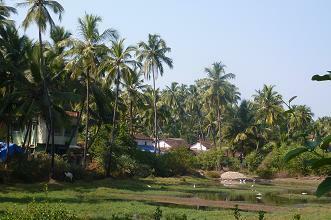 Alternatively some modern holiday appartments are available in Siolim. 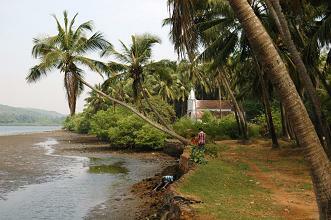 In the luxury bracket, Siolim House (http://www.siolimhouse.com/index.php) is a Heritage Hotel that is 275 years old. The seven, beautifully decorated rooms are set in attractive gardens and cost around £100 a night in peak season (more over the Christmas period). Stop at Little Goa, a small shack opposite the SFX High School (on the road between St. Anthony's Church and the old ferry port in Tar) for authentic chicken tandoori. Incredibly cheap and perhaps the best in Goa if you like it spicy! Good for take away snacks. If you are in Tar (by the old ferry port) look out for the traditional Goan restaurant on the second-floor of a bar at the main square. The restaurant caters for locals and a few tourists in the know. The food is excellent, spicy and cheap and the setting is great for people watching with the market square below. Just over the Chapora bridge, look out for a small bar on the left just before you reach the turning towards Arambol - another great place to watch the world go by. The inland location of Siolim village is largely responsible for its pleasant lack of tourist development, but the sea is nevertheless easy to reach with the closest beach being Morjim to the north.